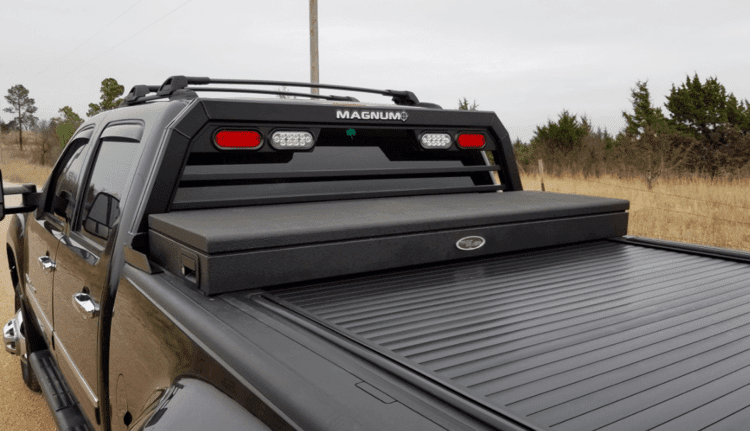 A Magnum truck headache rack is durable, made from sharp looking aluminum, and gives your truck the exact look you’re going for. Whether you’re looking to add lights with our Low Pro or High Pro Rack or prefer to keep things simple with our Standard Rack with a Window Cut Out, we have you covered. Our Low Pro sits approximately level with the top of your cab, while the Standard and High pro sit approximately 3″ above the cab. The only difference between the High Pro and Standard is the High Pro has lights. Our modular wire harness comes standard with the purchase of all lighted Magnum racks, so you’re equipped with the accessories that you need for your Rack. Better yet? The harness is plug-n-play, requires no wiring ability and is an easy, accurate, fast install. We offer the most complete line of truck headache rack accessories of any manufacturer in our field. Furthermore, our accessories are all interchangeable between all racks as they slide along our Glide Track which is the same size on all racks. Explore our accessories today, or learn more about the installation process, below. Drop the insert into the stake pockets and fasten into place. Do not fully tighten the bolt at this point. Position the rack evenly on bed rails. Align the back of rack to the edge of the truck bed. Insert the top bolts and tighten all four bolts. Run the truck racks wire harness down between the cab and bed of the truck. 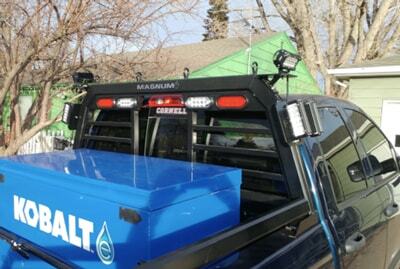 Unplug 7-way trailer lights at the rear of the truck and connect the modular wire harness. Run the wire harness from BACK to FRONT secure it along the way with cable ties. Connect the modular wire harness to the racks wire harness and secure with electrical tape. Coil access wire and secure with a cable tie. Check that all lights are properly working before operating. Each Magnum truck headache rack comes with two stake pocket tie downs. Maintain your truck’s value and minimize the possibility of opening the body to rust while using this easy installation option to get the job done. Select truck models have a plastic top rail cover that is intended to be cut away to use the stake pocket. This video details the easy process of cutting out that plastic cover. All manufacturers’ truck headache racks are functional; they prevent objects from coming through your back window. But in most cases, that’s where the story ends. Driven to satisfy the most demanding truck enthusiasts, Magnum has become the industry standard: extreme function combined with ultimate style. Furthermore, F3 MFG Inc. is proud to offer a limited lifetime warranty. While we hope that your purchase is always trouble free, if the unexpected arises, we want you to know that you’re in good hands.